Pakistan is the 5th largest motorcycle market in the world after China, India, Indonesia and Vietnam. With 7,500 new motorcycles being sold everyday, Pakistan is also the among the world's fastest growing two-wheeler markets. Passenger car and motorcycle sales in Pakistan are both soaring at rates of over 20% a year. Nearly 2.3 million motorcycles have rolled off the factories in Pakistan in the last 10 months. The production of motorcycles jumped 22.34 percent in the first four months of fiscal year 2017-18 (FY18), over the corresponding period of in FY17, according to the latest data from Pakistan Bureau of Statistics (PBS) as reported by the media. Pakistan automobile market is also expanding along with the motorcycle market. Sales of passenger cars soared 20.4% to 103,432 units in the first half of the current fiscal year of 2017/18, recently released official data shows. Car sales were 85,901 in the same period of last fiscal year, according to Pakistan Automotive Manufacturers Association (PAMA). 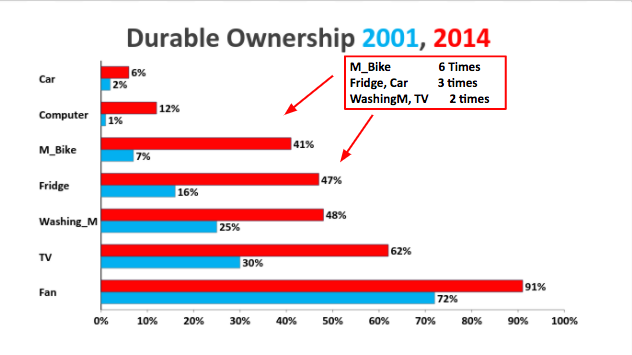 Ownership of consumer durables like computers, home appliances and vehicles is often seen as an important indicator of the size and health of the middle classes in emerging economies. Examples of periodic household surveys used by researchers to measure such data include NSS (National Sampling Survey) in India and PSLM (Pakistan Social and Living Standards Measurement) in Pakistan. Only 5% of Pakistanis in $2-$4 per day per person income group have college degrees. But 20% of those in $4-$10 have college degrees, according to the survey results. Who is Dr. Jawaid Abdul Ghani? The PSLM household data cited in this blog post is taken from a recent presentation made by Dr. Jawaid Abdul Ghani at the Karachi School of Business and Leadership (KSBL) where he teaches. KSBL has been established in collaboration with Cambridge University's Judge Business School. Prior to his current faculty position, Dr. Abdul Ghani taught at MIT's Sloane School of Management and Lahore University of Management Sciences (LUMS). He has a computer science degree from MIT and an MBA from Wharton Business School. Pakistan is the 5th largest motorcycle market in the world after China, India, Indonesia and Vietnam. With 7,500 new motorcycles being sold everyday, Pakistan is also the among the world's fastest growing two-wheeler markets. Passenger car and motorcycles sales in Pakistan are both soaring at rates of over 20% a year. 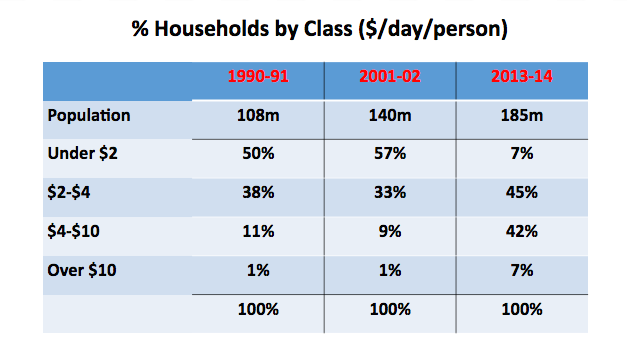 Pakistan has managed to significantly reduce poverty and rapidly grow its middle class since 2001. The country now boasts the world's third fastest growing economy among the world's top 25 economies with PPP GDP of over one trillion US dollars, according to the International Monetary Fund (IMF). 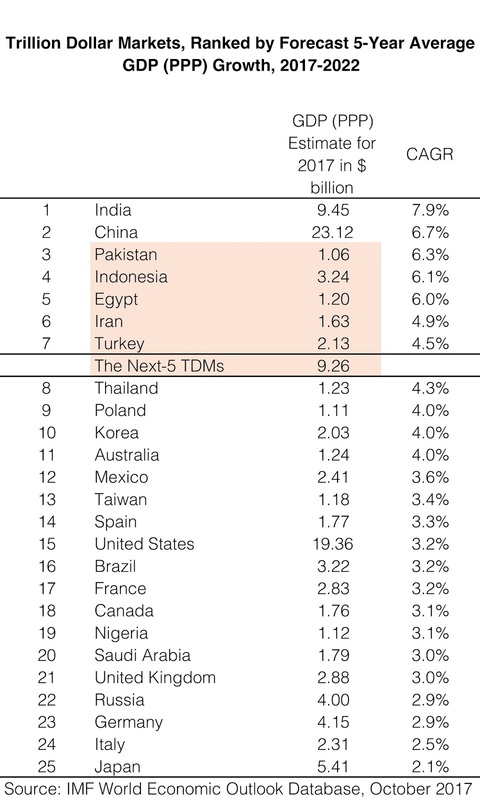 IMF has recently raised the country's 2018 growth forecast to 5.6%. spite of major political, security and economic challenges. The foundation for the rise of the middle class was laid on President Musharraf's watch by his government's decisions to invest in education and infrastructure projects that led to the expansion of both human and financial capital. My hope is that the continued improvement in security situation and implementation of China-Pakistan Economic Corridor (CPEC) related projects will bring in higher long-term investments and accelerate Pakistan's progress toward prosperity for all of its citizens. Just to add to the fact. Only in Sialkot the 3000 Units of Honda CD125 2018 model has been sold in last 2 and half months (since its launch). Great data! Good job pulling this together Riaz Haq. Hakikat: " In comparison, BD has 300K passenger cars in total, and 1.6m motorcycles in total. " According to Bangladesh Reconditioned Vehicles Importers and Dealers Association (Barvida), the total number of registered private cars in the country was 3.5 lakh as of March this year. The size of the car market now stands between Tk 4,000 crore and Tk 5,000 crore with a growth rate of 15-20 percent annually. 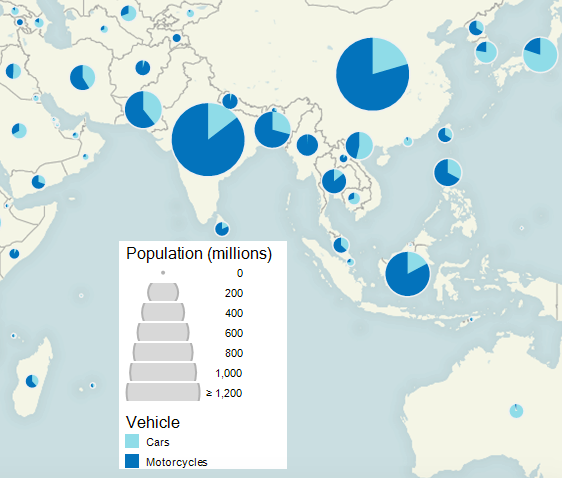 Barvida data shows 15,000 private cars are imported on an average per year. This growth was driven by the growing middle class. 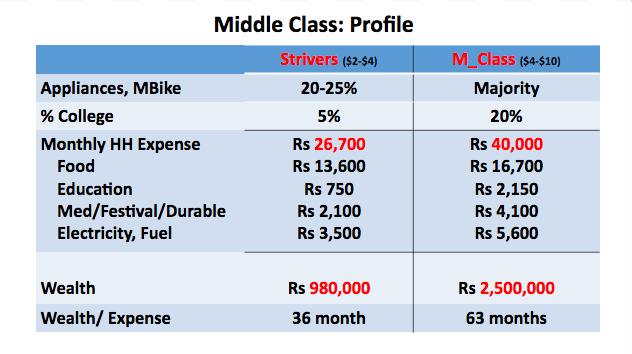 Boston Consulting Group in a research showed that two million Bangladeshis join the ranks of middle and affluent class every year. Per capita income rose to $1,602 in the last fiscal year, up from less than $500 a decade ago, according to the Bangladesh Bureau of Statistics (BBS). Growing urbanites and middle class have been creating new demand for auto loans. Auto loan portfolio of over three dozen private commercial banks grew at an average of 44.25 percent in the last three years, according to Bangladesh Bank data. Mohammed Nurul Amin, managing director of Meghna Bank, also attributed the growth to falling lending rates. Banks are currently lending auto loan at 11 to 12 percent while the rate was above 16 percent two years ago, he said. Currently, the average interest rate of other consumer loans is 13 percent, according to the central bank. Moreover, the cars are mortgaged for which banks are more inclined to giving out loans. Habibullah Don, president of Barvida, said the demand for cars has been growing due to a lack of quality public transports. “Middle class people are compelled to buy cars as they cannot use the shabby public vehicles,” said Don. Bangladesh Bank's ceiling on the auto loan at 50 percent of the total value is a barrier to the growth of car sales, he said. Five years ago, up to 70 percent of the value could be availed from loans. Toyota leads the reconditioned private car market with 88.5 percent share, according to the Mutual Trust Bank report. The second, third and fourth positions are occupied by three other Japanese automotive manufactures -- Nissan, Honda and Mitsubishi. Toyota is the highest selling brand with two price groups in the market. Axio Sedan and Axio Fielder are in lower price categories selling between Tk 17.5 lakh and Tk 19.5 lakh. Allion and Premio are the higher price categories selling between Tk 24 lakh and 28 lakh, according to the report. Pakistan’s consumer confidence has reached an all-time high of 111, up by nine points in the third quarter (July-September) of 2017, from 102 points in the previous quarter (April-June), according to the Nielsen Global Survey of consumer confidence and spending intentions. KARACHI: Imports of used cars and minivans surged to 65,723 units in 2017, up almost 70 per cent from 38,676 units a year ago, latest data released by the auto industry shows. Toyota Aqua imports climbed 96pc to 7,123 units from 3,622 units in 2016. As many as 5,088 units of Suzuki Every were brought into Pakistan in 2017, up 14.6pc year-on-year. Imports of Daihatsu Hijet rose 34.5pc to 3,367 units. The arrival of Suzuki Alto doubled to 4,158 units from 2,013 units a year ago. Suzuki WagonR imports surged 115pc to 3,574 units. Imports of Honda Vezel and Toyota Land Cruiser stood 2,431 units and 3,301 units in 2017, up 57.5pc and 55.7pc, respectively, on an annual basis. The overall volume of imported used vehicles grew 65pc to 76,635 units in 2017 from 46,500 units a year ago, data showed. Low interest rates, increase in auto financing by banks and lifting of vehicles by investors for cab services like Careem and Uber boosted the imports of used cars as well as sales of locally assembled vehicles. The government imposed regulatory duties on the purchase of foreign used vehicles in October, which largely failed to dent the overall annual import figures. Sales of locally produced cars rose 20.4pc on a year-on-year basis to 103,432 units in July-December. According to the Pakistan Bureau of Statistics, overall imports of cars increased 64pc to $276 million in July-December. Pakistan Association of Automotive Parts and Accessories Manufacturers’ former chairman Aamir Allawala said the local vending industry lost estimated revenue of Rs23 billion last year. The estimate is based on taking the average local content per vehicle of Rs300,000 on imports of 76,645 units in 2017. This is in contrast to a loss of Rs14bn in 2016 with imports of 46,500 vehicles. He said imports of used cars were the biggest impediment to investment by existing assemblers, new entrants and part makers. He said the government has modified the procedure for the payment of duties and taxes to curb imports of used vehicles. “Time has come for the existing players to make prompt investment in capacity expansion, improve localisation, introduce new models and reduce delivery time to eliminate the menace of premium,” he said, adding that an increase in production will boost tax revenue and create jobs. In the near future, Hyundai, Kia and Renault will set up plants in the country. Sindh Board of Investment (SBI) Chairperson Naheed Memon presided over a ribbon-cutting ceremony on Saturday to mark the beginning of construction on Aisha Steel Mills’ (ASM) expansion plans. ASM, an Arif Habib Group company, has laid out plans to expand its capacity to a total of 700,000 tons per annum from its current capacity of 220,000 tons. Addressing the ceremony, Memon said, “Initiation of expansion of Aisha Steel Mills reflects the confidence investors have in Sindh and Pakistan, strengthening our resolve to continue on this path of progress. “We are seeing expansion and new projects in almost all areas of manufacturing in Sindh,” the chairperson added, in a statement released by Arif Habib Corp.
She said that the board is committed to facilitate industrial investment in Sindh, which has the best infrastructure for setting up industries. On completion of expansion, ASM is expected to contribute over Rs10 billion to the revenues of the government. Pakistan's National Logistics Cell has signed a MoU with Daimler AG to assemble Mercedes-Benz Trucks in the country. With the upcoming China-Pakistan Economic Corridor (CPEC) and a new network that links Pakistan's seaports in Gwadar and Karachi with Northern Pakistan, this new plant will boost Commercial Vehicle sales in Pakistan. News report further confirms that Major General Mushtaq Faisal, the director general, and Zia Ahmed, Chief Executive Officer of Pak NLC Motors signed the MoU on behalf of NLC. On behalf of Mercedes-Benz Trucks, Klaus Fischinger, head of the executive committee, and Dr Ralf Forcher, head of sales, were present to sign the MoU. Major General Faisal further said that this is a historic moment for Pakistan’s commercial vehicle industry. A report on Tribune further quotes him saying “The local assembly of Mercedes‐Benz trucks would prove as a strategic opportunity that would leverage the modernisation of Pakistan’s logistics industry,” said the official. Pakistan government has promised to give more incentives in its Auto Development Policy 2016-21 and these locally-assembled Mercedes-Benz trucks would be sold at competitive prices. This is also a huge move for Pakistan with the China-Pakistan Economic Corridor (CPEC) coming up, Daimler seems to have invested at the right time to make the most of Pakistan's logistics movement to China. In an IANS report, Dr Ralf Forcher, head of sales at Mercedes‐Benz Special Trucks was quoted saying "Pakistan’s infrastructure and construction sectors have registered significant growth in recent years, giving a boost to the logistics industry that, in turn, means increased demand for commercial vehicles." The demand for Commercial vehicles in Pakistan is set to go up with CPEC and a new network that links Pakistan's seaports in Gwadar and Karachi with Northern Pakistan. Cars are getting pricier again. For the third time since December when the currency first started to take its downward spiral, local automakers have raised prices. Whereas Suzuki raised prices by as much as Rs30,000, Toyota raised prices between Rs50,000 to Rs1.9 million for some of its imported vehicles. Honda, on the other hand, raised prices by up to Rs100,000. The Rupee to US Dollar depreciation continued well into July – falling by nearly 15 percent since December. Against the Japanese Yen, the Rupee fell by 17 percent during this period. The price-hikes have been associated to high costs of manufacturing – not only rising costs for Completely Knocked Down (CKD) kits; but also locally-manufactured auto parts. According to data reported by Pakistan Bureau of Statistics (PBS), cost of CKD imports for motorcars went up by 21 percent between July-May 2018 whereas sales during the period rose by 16 percent. Existing OEMs and auto-part makers are still dependent on imported CKD kits, functional parts, and commodities like iron, steel, aluminum, plastic etc. which are mostly imported. In an interview with BR Research, the Chairman of PAAPAM, Iftikhar Ahmed shared his estimates for localization in the cars segment, putting Suzuki’s at more than 70 percent, Toyota more than 55 and Honda around 51 percent. On average, he believes localization should be around 60-61 percent for all the three OEMs. This means, nearly 40 percent of the content is still of imported value. BR Research’s own calculations suggest localization levels during FY17 for an average car manufactured in the country may be 51 percent – (read “The Fault in our Cars”, published Feb 6, 2018) – whereas share of imported content in car prices would be around 22 percent. The rest is sales tax and customs duties. If imports become expensive, tax collected is also higher. Moreover, for cars with strong demand like Wagon-R or the more sophisticated SUVs or cross-over SUVs like Toyota Fortuner or Honda BR-V, localization is not a lot. This means, OEMs have no choice but to raise prices to keep their margins intact. The sector has had three major Japanese car makers, who started off by producing 33,000 units back in 1996, growing to the peak of 176,000 units in 2007, and since laid low. Now the volumes are hitting 200,000 cars and are expected to go up with the culmination of the new auto policy with at least three more players entering the field (Read “The Year of Cars”, Jan 29, 2018). There is no doubt that the three Original Equipment Manufacturers (OEMs) have invested in Pakistan. Recently, Indus Motors expanded capacity worth Rs4 billion. Honda invested Rs240million to expand its press and paint shops. The sector provides direct and indirect jobs to over 2 million people. There is a large parts manufacturing industry that runs parallel to the primary industry. Technology transfer has also happened with the support of carmakers. Vendors have signed technical agreements with prominent counterparts abroad to increase capabilities. Indus Motors Chief, Ali Jamali told BR Research that Toyota in Pakistan buys 126 million parts from local vendors every day. Seems like a huge number! But let’s consider another huge number. Import bill for Completely Knocked Down (CKD) kits has grown from $268 million in FY09 to $673 million in FY17, according to data retrieved from Pakistan Bureau of Statistics (PBS). That’s more than Completely Built Unit (CBU) imports. This means, the imported content to manufacture one unit of car, on average, has remained between $3,000 to $4,000 through the years. With such a huge import burden for manufacturing, have we truly substituted imports? The production of motorcycles during the first eleven months of fiscal year (2017-18) increased by 15.44 per cent as against the corresponding period of last year, Pakistan Bureau of Statistics (PBS) reported. As many as 2,650,233 motorcycles were manufactured during July-May (2017-18) against the output of 2,295,846 during July-May (2016-17), showing growth of 15.44 per cent, the latest PBS production data revealed. The production of cars and jeeps witnessed 20.10 per cent increase during the period under review as 214,904 jeeps and cars were manufactured during July-May (2017-18) against the production of 178,944 units during July-May (2016-17). The production of light commercial vehicles (LCVs) witnessed an increase of 18.54 per cent in production during the period under review by growing from 22,927 units last year to 27,178 million during 2017-18. The production of tractors also increased from 50,049 units last year to 67,371 units, showing growth of 34.61 per cent while the production of trucks increased by 20.27 per cent, from 7,104 units to 8,544 units. However, the production of buses during the period under review witnessed the negative growth of 31.54 per cent by going down from the output of 1,043 units to 714 units. Meanwhile, on the year-on-year basis, the production of motorcycles increased by 14.57 per cent by growing from the output of 231,295 units in May 2017 to 264,984 units in May 2018. The production of tractors also witnessed an upward growth of 19.56 per cent by growing from 5,746 units in May 2017 to 6,870 units in May 2018. The production of jeeps and cars increased by 0.74 per cent as the country manufactured 18,227 jeeps and cars during May 2018 against the production of 18,094 units in May 2017, the PBS data revealed. The production of LCVs witnessed decrease of 12.96 per cent in production by going down from the output of 2,368 units in May 2017 to 2,061 units in May 2018. The output of trucks witnessed the negative growth of 7.02 per cent by going down from the output of 869 units in May 2017 to 808 units in May 2018 while the output of buses declined by 19.51 per cent by declining from 82 units to 66 units. It is pertinent to mention here that the overall 'Large Scale Manufacturing Industries' (LSMI) of the country witnessed the growth of 6 per cent during the first eleven months of the current fiscal year compared to the corresponding period of last year. The country’s LSMI Quantum Index Numbers (QIM) was recorded at 149.19 points during July-May (2017-18) against 140.75 points during July-May (2016-17), showing growth of 6 per cent. The highest growth of 3.62 per cent was witnessed in the indices monitored by Ministry of Industries, followed by 1.58 per cent growth in the products monitored by Provincial Bureaus of Statistics (PBOS) and 0.80 growth in the indices of Oil Companies Advisory Committee (OCAC). On yearly basis, the industrial growth increased by 2.76 per cent during May 2018 as compared to same month of last year, however, on month-to-month basis, the industrial growth decreased by 11.63 per cent in May 2018 when compared to growth of April 2018, the PBS data revealed. Despite the massive local production, the motorcycle imports into the country witnessed 15.52 percent increase during the fiscal year 2017-18 against the corresponding year, according to Pakistan Bureau of Statistics (PBS). Pakistan imported motorcycles worth $106.382 million in July-June (2017-18) against the imports of $92.089 million in July-June 2016-17, showing growth of 15.52 percent. Meanwhile, on a year-on-year basis, the motorcycle imports surged by 22.83 percent during the month of June as compared to the same month of last year. The motorcycle imports in June 2018 were recorded at $9.562 million against the imports of $7.785 million in June 2017, the PBS data revealed. On a month-on-month basis, the imports of motorcycles witnessed a nominal increase of 0.81 percent during the month of June 2017 when compared to the imports of $9.485 million in May 2018, according to the data. Meanwhile, the local production of motorcycles during the first eleven months of fiscal year (2017-18) increased by 15.44 percent as against the corresponding period of last year. As many as 2,650,233 motorcycles were manufactured during July-May (2017-18) against the output of 2,295,846 during July-May (2016-17), showing growth of 15.44 percent, the latest PBS production data revealed. On the year-on-year basis, the production of motorcycles increased by 14.57 percent by growing from the output of 231,295 units in May 2017 to 264,984 units in May 2018.